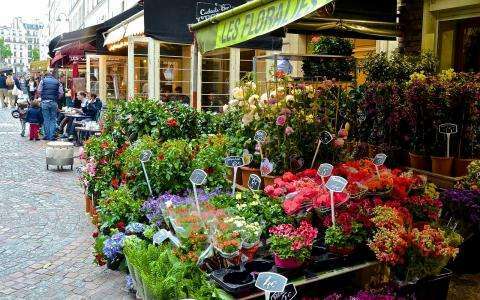 Rue Cler is a nice pedestrian market street on the 7th district with a variety of shops, stalls and terraces. if it's not too early (or sunday) when you go there, don't miss the Rue Saint Dominique, a perpendicular street full of nice boutiques! Open tuesday to saturday from 10.00 a.m. to 6.00 p.m., and sunday morning. Main entrance of the Grand Hotel Leveque watch the rue Cler on video: www.youtube.com/watch?v=dP9ObS66tfs Rue Cler is especially convenient for the neighborhood because it is open on Sunday mornings. Many families attend mass at 11am at St. Pierre du Gros Caillou on rue de Grenelle, then head immediately to rue Cler for their baguettes, cheese, bottle of wine, cuts of meat and desserts. Get there early as it becomes extremely crowded after 11 am on Sundays. Being near rue Cler is one of the great pleasures of living in Paris, whether for a week or a lifetime. Start at the top of the street, near the Ecole Militaire Metro stop, on the corner of La Motte Piquet and rue Cler. There is a large post office with yellow signs on the corner; good rates if you want to change money. Don't forget to stop at Lenôtre, the takeaway gourmet food and pastry shop located next to the métro on Ave. de la Motte Piquet. This leading Pâtisserie is one of the top caterers in France. A great place to buy pâtisseries, hors-d'œuvre, side dishes and even main dishes for your meal. Lenôtre caters for the best functions in Paris and you will find their selection to be mouth watering. When the founder died at a ripe old age a few years ago, the country went into mourning. Happily, the great pastry making tradition is carried on by his family. Let’s take a stroll down rue Cler. The shops below might change slightly, but the spirit of the street as the heart of this lively neighborhood is what makes it so special. This Paris blog is written by a local who lives in the neighborhood. The funny stories and recommendations will keep you updated on new shops and restaurants in the neighborhood.